The University of Lynchburg Debate and Forensics Society will present a forensics showcase with award-winning speeches on Tuesday, September 25, at 6 p.m. in the Westover Room. The event is free and open to the public. The student group has won numerous awards in regional competitions over the past several years. 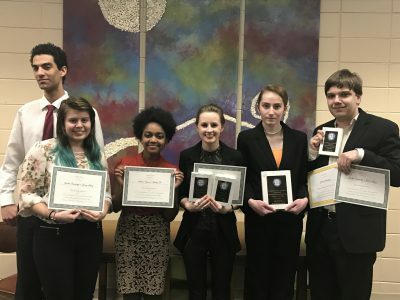 For example, Chelsey Fix ’19, president of the Forensics and Debate Society, won first place in two categories at a tournament in North Carolina earlier this year. In the September showcase, the students will present refined versions of their competition pieces. Adrianne Jordan ’22 will be recite poetry and Fix will give an after dinner speech, an original speech designed to make a serious point through the use of humor. Her speech about Endangered Ducks won first place for after dinner speaking at last year’s tournament.